One of the things that I ran out was my facial wash, and I was in dire need for an affordable and decent one. As much as I love my skin care and makeup, I've never cared much for facial wash since my only criteria for them are to be able to cleanse well and be gentle to the skin. More importantly, they MUST be affordable. So in my rush to select the most affordable of all, I went with the Hada Labo Shiryojyun Arbutin Whitening facial wash which I distantly remembered worked well. 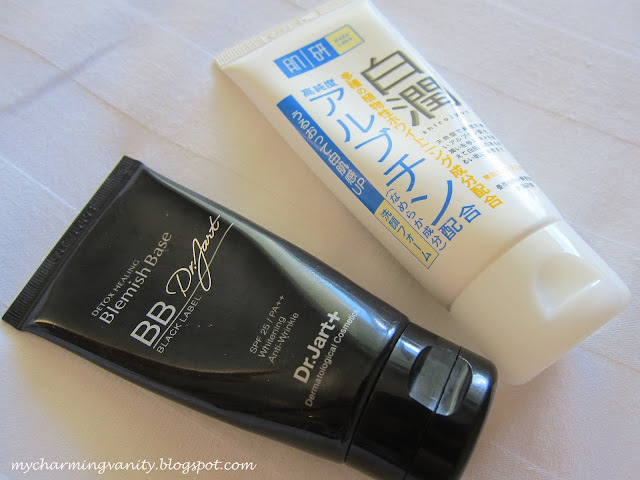 I also went ahead and bought the Dr. Jart Black Label BB Cream at Sasa as I was desperately deprived of Asian makeup. Fast forward to almost 6 weeks later. I realised that my skin is in a surprisingly good stage now. Considering the not so ideal sleeping schedule, the work stress and the occasional 'I went to sleep with my makeup on', my pores are looking at its almost smallest, and my overall skin texture is soft and firmer. With this revelation, I decided to investigate the changes in my routine and realised that what I did different was using the facial wash and BB cream. Of course, there was also the use of a new facial serum which happened even earlier but I think that deserve a separate post of itself. I am loving the rediscovery of the Hada Labo facial wash. At RM16.90 for 50g (the price haven't changed since the last I reviewed the product in 2010), it delivers a gentle wash and preps my skin well for the next step within my facial routine. As for Dr. Jart BB cream, it is no stranger to my vanity however, I was using the Silver label previously. Amongst all the BB cream that I've tried out so far, Dr. Jart BB cream is the most non-pore clogging and doesn't oxidize crazily formula. As compared to the Silver Label, the Black Label delivers a more matte finish and is also shade-wise, slightly darker than the Silver Label. The coverage and lasting power that it delivers is also decent. With my skin in a rather good condition now, I would apply the Bb cream and top it off with some concealer for my dark spots and and I'm off the house. I noticed that it will stay on good for about 7 hours, till it starts to gradually wear off. Compared to the usual foundation, it is also easier to remove. Just one cotton dabbed with my Bioderma Makeup remover and everything will go off. At RM110, this is definitely a good investment. Have you revisited any products lately?